Cajun boudin is available most readily in southern Louisiana, particularly in the Lafayette and Lake Charles area, though it may be found nearly anywhere in "Cajun Country" including eastern Texas. There are restaurants devoted to the speciality, though boudin is also sold from rice cookers in convenience stores along Interstate 10. Since boudin freezes well, it is shipped to specialty stores outside the region. Boudin is fast approaching the status of the stars of Cajun cuisine (e.g., jambalaya, gumbo, étouffée, and dirty rice) and has fanatic devotees that travel across Louisiana comparing the numerous homemade varieties. 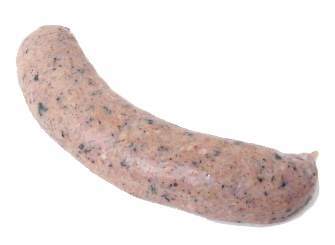 Try this Boudin recipe yourself and see what all the talk is about! Place the pork and pork liver in separate saucepans, cover with water, then bring to a boil. Reduce heat, skim and simmer until tender, about 1 hour Cook the rice. Remove the cooked pork and liver and let cool Discard the stocks. Put the pork, liver and onions through a meat grinder with a coarse grind. Transfer the mixture to a large bowl or meat mixer and mix in the green onions, garlic, parsley, cooked rice and seasonings. Stuff into sausage hog casings with a sausage stuffer or sausage stuffing attachment for your meat grinder.